Picking up yet another group of loose threads this week by finally visiting some of my favorite blogs. There's some good work happening out there! 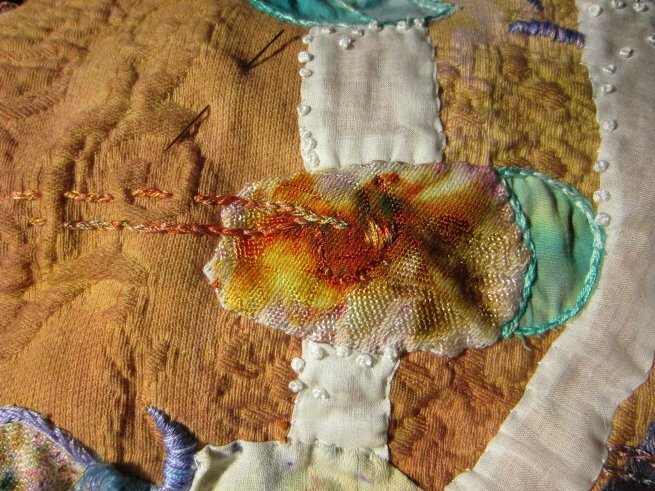 I have to start with this quilt - "Bursting Out!" 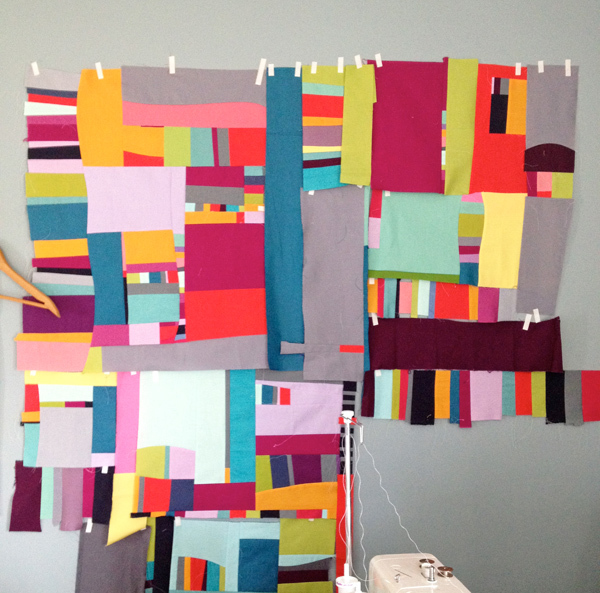 - an amazing interpretation of the Mod-Mood Quilt by Mina at Kinda Quilty. WOAH - I love getting lost in the twisting colorful paths and being held in the BOLD red ground. Well done - a real GEM! LOVE this Improv in progress by Ashley at Film In The Fridge. I like the play of bright colors against the flatness of gray. I also like the marks of those little pieces of white tape holding the fabric on the wall. I love the messiness of improv, its THINKING OUT LOUD! Appropriately called... I Never Promised You A Rose Garden by Lynn at Lilly's Quilts. 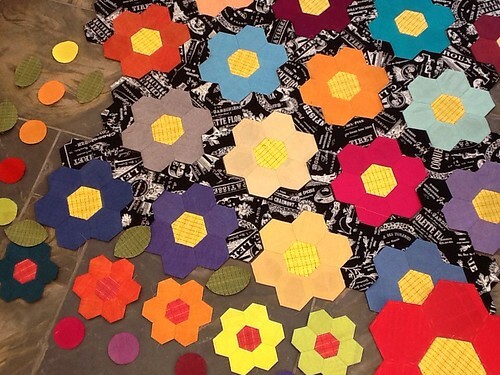 I like the black & white print background for the hex flowers. It's a SASSY update. 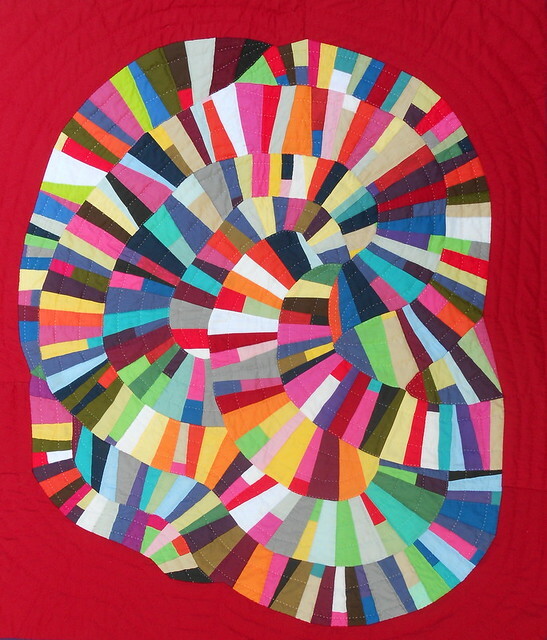 This sweet quilt by AnnaLoiseLikes, reminds me of her blog, sublime with fashion, texture, color, atmosphere, art and craft. Notice the unusual juxtaposition of delicate floral prints with stripes. Kinda makes it all GLOW. Dear Blandina of La Griccia writes... 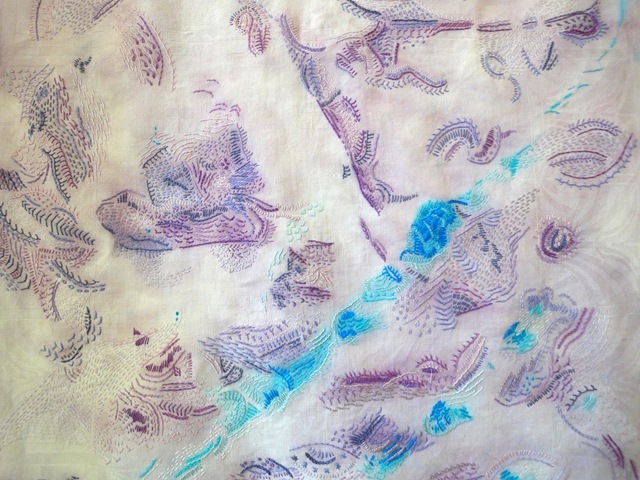 The embroidery literally flew from my fingers... about her abstract, improvisational stitching on this cabbage stained linen. EPIC! HEAVEN! I am totally inspired by the translation project Heather is immersed in at True Stitches. She is translating the natural history sketches by Louis Nichola from Codex Canadensis into embroidery. This is FIERCE work, the stitching as well as her writing about her process and the concepts she is exploring. I love her honest post on professional envy. Finally an image of compassion shared for a broken-hearted friend by Deb at More Wiffs... I like how the small DEVOTED details of hand stitching can speak volumes.